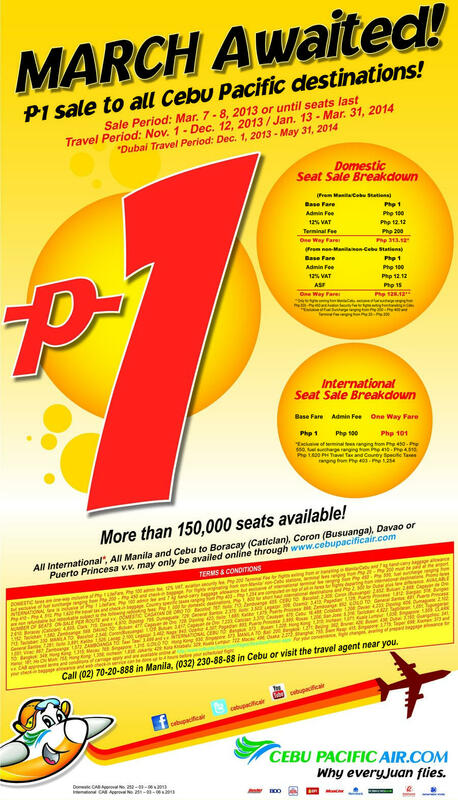 Low-cost airline Cebu Pacific announces today a new Piso Fare promo for the last two months of 2013 and early months of 2014. This Piso Fare promo offers 1 Peso base fare to all destinations. The travel dates is from November 1 to December 12, 2013 and January 13 to March 31, 2014. Over 150, 000 one-peso seats are available for booking, most of which can only be availed through online booking at www.cebupacificair.com. Tickets can be purchase until March 8, 2013 or until seats last, whichever comes first. For those who would like to plan for their vacation on the said travel dates, it would help to take note of the Philippine Holidays schedule. The Philippine Government has already issued a schedule for the entire year 2013. Please be reminded that the base fare is exclusive of fuel surcharge, taxes and other miscellanous charges. Also, please be familiar with the Terms and Conditions of Cebu Pacific to avoid inconvenience. Cebu Pacific is the largest airline company in the Philippines. In 2012, they flew over 13 Million passenger. They currently serve 33 domestic and 20 international destinations. Cebu Pacific is operates in a low-cost airline model. HOW ABOUT DECEMBER 2014?DO YOU HAVE A PESO FARE PROMO?